Recently I shared with you all how to make simple trail mix, Nutrition Stripped Energy Mix. Today, I share with you a recipe with some sweetness and a hint of spice, Spicy Sweet Nut & Seed Mix. This mix reminded me of honey roasted peanuts (which are way too addicting to be good for oneself) with a hint of heat and smokey-ness. This one’s sure to be a crowd pleaser and perfect for taking to BBQ’s, potlucks, gatherings with friends and families, and other parties. You all know I’m all about having fun in the kitchen and keeping it simple. This recipe is quick to put together and to bake. Also, this is a great recipe to get kids to eat nuts and seeds (fiber, protein, healthy fat, calories, nutrients galore!) as sometimes they don’t prefer the “natural/bland” taste of nuts and seeds. You can simply use less cayenne to decrease the heat/spiciness for their enjoyment. You may be wondering what those fun little dots are in this mix, if you aren’t, well I’m about to tell you. It’s amaranth! Amaranth is a psuedograin, similar to quinoa, as it’s technically a seed but often used and referred to as a grain. Amaranth is an amazing gluten free “grain”, it’s full of fiber, protein, lower in carbohydrate than most grains, contains higher amounts of lysine (an essential amino acid which is typically lower in plant based proteins). It also contains a variety of nutrients including vitamin B6, thiamine, niacin, riboflavin, vitamin E, potassium, magnesium, zinc, copper, calcium, iron, manganese, and phosphorus. Not only is amaranth nutritious, it’s also versatile and tastes great. 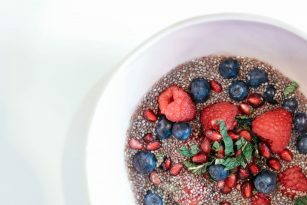 Amaranth reminds me of grits, with a more rich nutty flavor, therefore it’s the perfect healthy alternative to grits! When cooked it becomes slightly mushy and gelatinous (wow, this is starting to sound very appetizing huh?) and holds together similar to grits. Amaranth can also be popped like popcorn, although the “kernels” are not as large as popcorn due to the smaller size of the amaranth seed, it’s still a fantastic treat. And lastly, it can be used it in making granolas and nut/seed mixes in the oven. No pre-cooking or boiling prior, this is raw amaranth seed in this recipe, which gives this nut & seed mix another crunchy texture and taste profile. In a small mixing bowl, combine the maple syrup and all the spices/seasonings. Combine the nuts and seeds in a separate mixing bowl. Pour the liquid mixture over the nuts and seeds and stir until throughly coated. Using a flat cookie sheet, spread the nut mixture to ensure even toasting. Check every 5 minutes and stir. Keep an eye on this mixture, every oven setting is different and when toasting nuts and seeds they may burn very quickly! Keep in an air tight bag/container at room temperature for keeping. WARNING// this.is.addicting. I suggest pre-portioning out about 1/4-1/2 cup of this mix and keeping the entire batch away from you…unless you have more self-control than I around sweet things ha.